They were supposed to celebrate their wedding anniversary this month. But that will never happen after Madam Salinah Mohamed's husband and family decided to take her off life support. The police officer, 41, sustained severe head injuries after being hit by a car on Sunday at the junction of Maxwell Road and Shenton Way while walking to the MRT station on the way home from work. She was taken to the Singapore General Hospital (SGH), where she was in a deep coma and put on life support. A 51-year-old male driver was arrested for dangerous driving, and investigations are ongoing. A CT scan yesterday revealed that Madam Salinah was brain dead. Following the scan, her family decided to take her off life support. Her husband, Mr Indra Shaiful, 41, a chauffeur, told The New Paper yesterday: "I can choose to continue keeping her alive, but she is suffering. We should just accept her fate and let her go." He posted an invitation on Facebook yesterday, asking friends and family to visit his wife one last time at the hospital. He said: "I am strong, but I will let it out later and cry. "It is pointless for me to cry now because I want the kids to look at me and think their daddy is strong even though he lost someone he loved." The couple have three children, two girls aged 12 and nine, and a boy aged 11. He is concerned about his youngest child, who developed a high fever after she found out about her mother's death. Mr Indra revealed that the couple had planned to celebrate their wedding anniversary with a short getaway at the end of the month. They had been married for 14 years. "We didn't have any confirmed plans but we did think of going to Batam," he said. Madam Salinah's body will be taken to her father's home in Yishun after the post-mortem, which will be carried out this morning, he added. 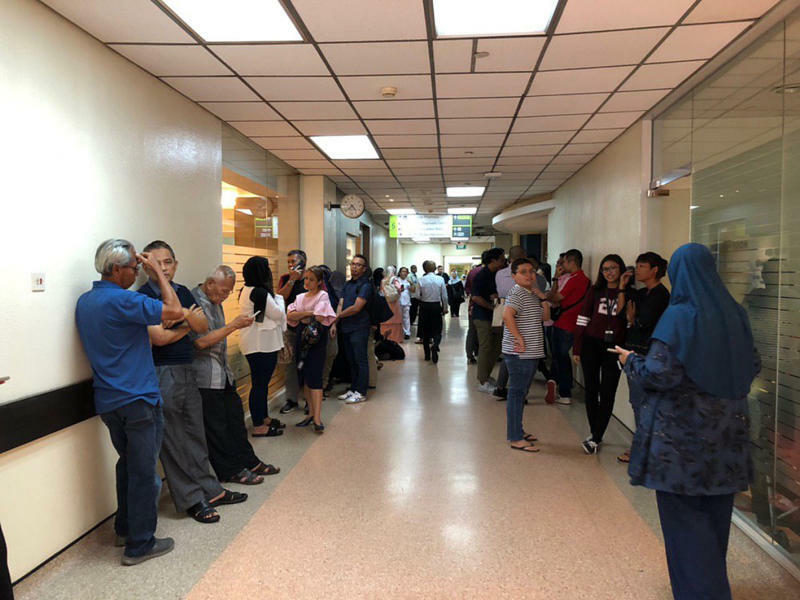 At the SGH at 3pm yesterday, about 50 relatives and friends, many of them distraught, gathered outside the intensive care unit . Among them were officers from the Singapore Police Force, which Madam Salinah, a staff sergeant, had served for the past 20 years. Two colleagues, Madam Ellyza Abdul Rahman, 38, and Madam Fadila Abdul Rahman, 39, both station inspectors at the Police Cantonment Complex, said they last saw Madam Salinah last week when their families enjoyed a staycation at Grand Hyatt Singapore. They had known each other since 2006. Choking back tears, Madam Ellyza said: "She was the kindest, most caring person I knew. She was very patient and always puts others before herself." The three families had planned to surprise their children with a trip to Melbourne during the March school holidays. "Salinah was very excited because it would have been one of the farthest places her kids would have been to," said Madam Ellyza.